The most recent episode of Agents Of S.H.I.E.L.D. didn't turn out the way once thought. After learning that the episode, "The Good Samaritan," would be an origin story for Robbie Reyes, it was assumed that Robbie Reyes would be telling a story identical to the comics, which depicted Robbie allowing the spirit of serial killer Eli Morrow to possess his body and become the Ghost Rider. However, that's not how it played out on #AgentsOfSHIELD. There was confirmation early on that indicated that Robbie Reyes's origin as the Ghost Rider would be tweaked for Agents Of S.H.I.E.L.D., but no one could have predicted the turn of events that would see Robbie Reyes become the Ghost Rider on the series. "The Good Samaritan" depicted said events and more, leaving us with more than just an Easter Egg drop for a future episode. To sum it up: Robbie and Gabe are driving down a street when they are gunned down by a local gang. As the shooting commenced, Robbie loses control of the car, flies out of the vehicle and dies. Gabe remains trapped in the car, paralyzed, as Robbie lies dead in front of his eyes. At this point in the story, Gabe's and Robbie's interpretation of what took place differ substantially. Gabe witnessed "a good samaritan" helping him out of the crashed vehicle and saw the same gentleman walk over to Robbie to check on him. According to Gabe, when the good samaritan checked on Robbie, Robbie woke up. However, Robbie witnessed (and felt) something completely different. Robbie did witness someone ride over on a motorcycle and pull Gabe out of the burning vehicle. Then said person walked over to Robbie and asked him if he wanted to live, but this person wasn't really a good samaritan. Guess Who the Good Samaritan Is? After agreeing to the deal struck, the Ghost Rider (presumably #JohnnyBlaze) touched Robbie's head and transformed Robbie into a Ghost Rider. The scene ends after the encounter between Robbie Reyes and the original Ghost Rider, but we can assume that the other Ghost Rider will return at a future time. Regardless, the episode "The Good Samaritan" proves two things: One, there's more than one Ghost Rider in the Marvel Cinematic/Television Universe. And two, Johnny Blaze is the newest Ghost Rider on Agents Of S.H.I.E.L.D. 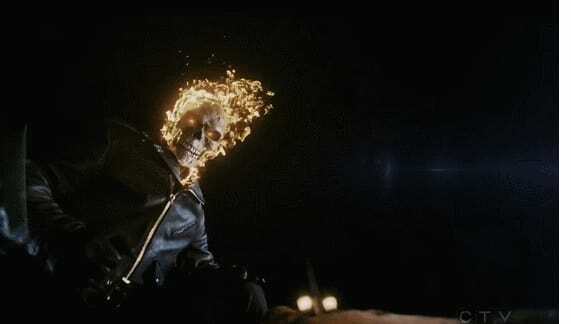 First of all, it's obvious there are more Ghost Riders in the #Marvel universe, but in regards to how we know that the Ghost Rider who appeared is Johnny Blaze, we simply need to look back at last week's episode, which dropped several Easter Eggs hinting at Johnny Blaze existing in the same universe. In last week's episode, when Lucy Bower visited the basement of the residence where the Darkhold was kept, she came across a poster to an attraction called the Quentin Carnival. In the comics, the Quentin Carnival is where Johnny Blaze starred as a motorcycle stuntman before he became the Ghost Rider. Inside the basement, the Quentin Carnival poster isn't the only memento that could reasonably belong to Johnny Blaze — a motorcycle and leather jacket can be seen alongside it — all mementos consistent with Johnny Blaze's origin. Now, considering that last week's episode was all but teasing an appearance by Johnny Blaze, and this week's episode, "The Good Samaritan," just introduced a mysterious, unnamed Ghost Rider, it's fairly obvious that Johnny Blaze has made his way onto Agents of S.H.I.E.L.D. When Will Johnny Blaze Return? What's of more intrigue is when Johnny Blaze / Ghost Rider will make another appearance. The newest Ghost Rider to join Agents Of S.H.I.E.L.D. was only glimpsed in a flashback, who knows if he's still around? For all we know, Johnny Blaze could have placed his life as the Ghost Rider behind to settle down. But, seeing as how Ghost Rider (Johnny Blaze) just made a cameo on Agents Of S.H.I.E.L.D., it's fair to assume that Johnny Blaze will make another appearance soon.